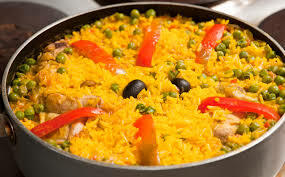 Arroz con Pollo Tradicional - Traditional Chicken with Rice - Tienditadepuertorico.com - Buy Puertorican Food Here!! it rest in the refrigerator for 1 hour, or better yet, overnight. chicken. Continue cooking over medium-low heat for 5 minutes. 3 Stir in all the remaining ingredients except the peas and carrots and bring to a boil. peas and carrots on top.